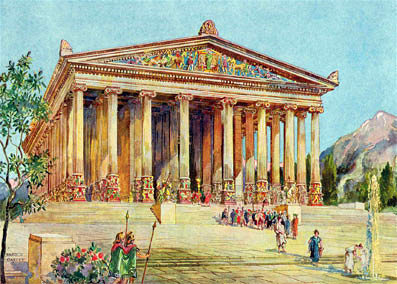 In this reconstruction the fifth and last Temple of the Ephesian Artemis is shown, not cold and white as we have grown to think of Greek temples, but glittering with the colours and the metal and the marble of actuality. In it were to be found the most priceless works of art of the age and countless hoards of treasure deposited there for safety by the Asiatic states. Begun about 350BC, it was not yet complete when Alexander the Great visited Ephesus in 334, and the Ephesians jealously refused to accept his offer to bear this heavy cost of construction.